Located in the south-east of France, on the east side of the Rhône River and south of the Luberon mountain range, the Bouches-du-Rhône department of Provence includes its capital Marseilles, Arles and Aix-en-Provence, among others. We stayed for a week in a time-share property – Le Moulin de Vernègues Hotel – near Mallemort, about 15 minutes from Aix-en-Provence, and managed to do quite a bit of touring the area by car. This rather exclusive hotel is located in the Pont Royal estate, with its own prestigious golf club designed by Seve Ballesteros, so of course Vin managed to play a round while we were there. While he did that, I went off on my own to visit nearby villages such as Charleval, La Roque-d’Anthéron with its 12th Century Cistercian Silvacane Abbey, and Rognes to stock up on picnic supplies at the mid-week market in the main street. Nearby, Aix-en-Provence is an attractive university town with a quintessential French city flavour unadversely affected by tourism and the hard edges of modern development. 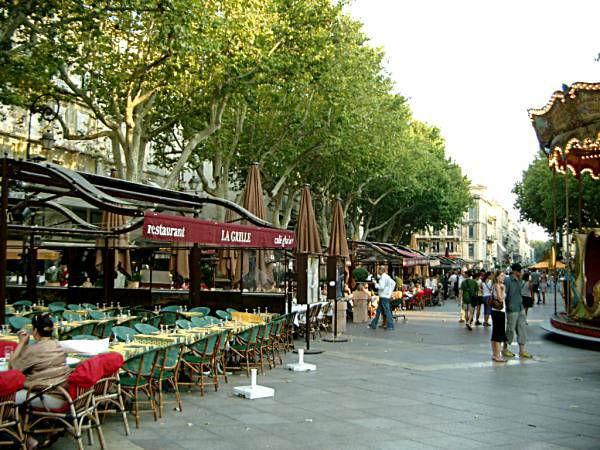 We enjoyed wandering the streets, particularly the central Cours Mirabeau lined on one side with banks and on the other with cafés, with fountains down its centre. Coming back from there we found a fruit and wine stall set up in a marquee by the side of the road near Lambesc. 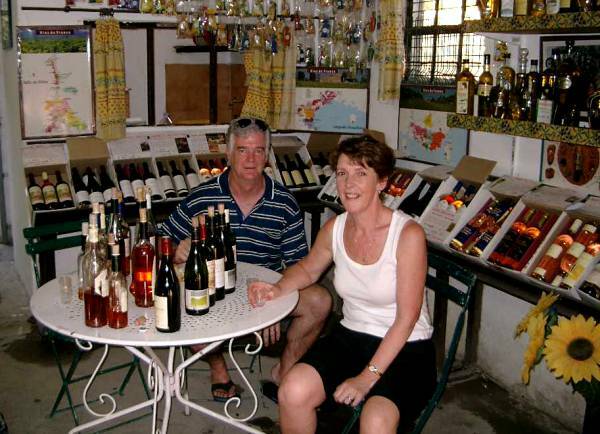 We spent a couple of hours there sampling the local wines while our host plied us with bread, cheeses and charcuterie! Naturally we ended up buying a case of mixed wines and some fruit to enjoy during our travels. 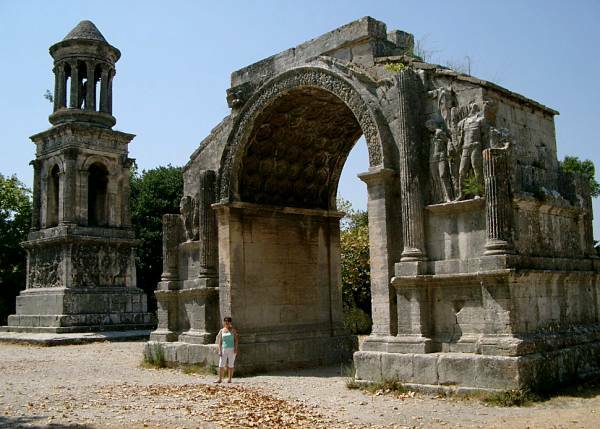 On one of our sightseeing jaunts we found the 1st Century BC Roman ruins at Glanum which include the mausoleum of the Julii and the oldest Triumphal Arch in France, while at Arles we saw the magnificent Roman arena and the remains of a Gallo-Roman theatre. 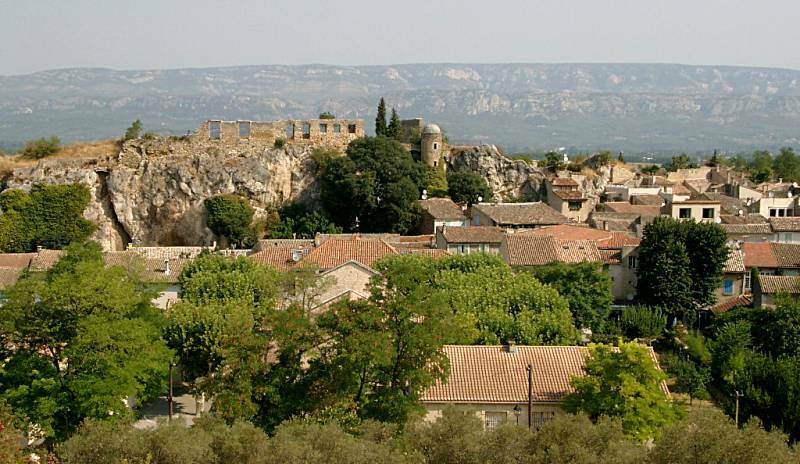 The rocky medieval hilltop village and fortress of Les Baux-de-Provence, in the Alpilles mountain range near St Remy de Provence, north-east of Arles, is a site which draws tourists by the thousands. 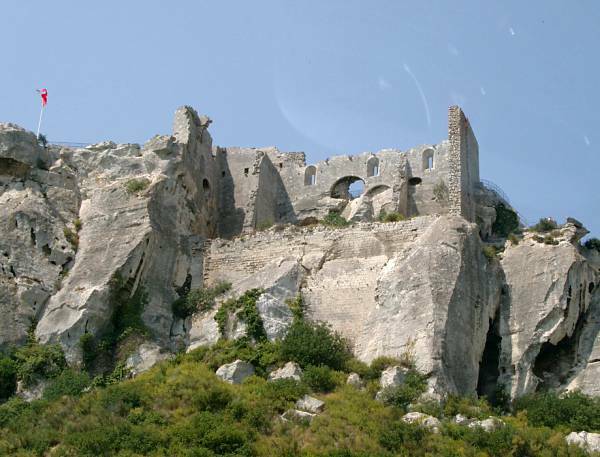 Occupied from prehistoric times because of its valuable defensive position, views from the hilltop extend as far as Arles and the Camargue. 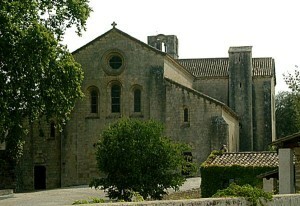 The village has been classified as one of the “Most Beautiful Villages in France”. The Bouches-du-Rhône department is famous for the Camargue plain, comprising large saltwater lagoons or étangs cut off from the sea by sandbars and encircled by reed-covered marshes which are in turn surrounded by a large cultivated area. It is home to more than 400 species of birds, particularly the flamingo. The area is also famous for the wild, white Camargue horse and bulls – the raising, fighting and eating of them. 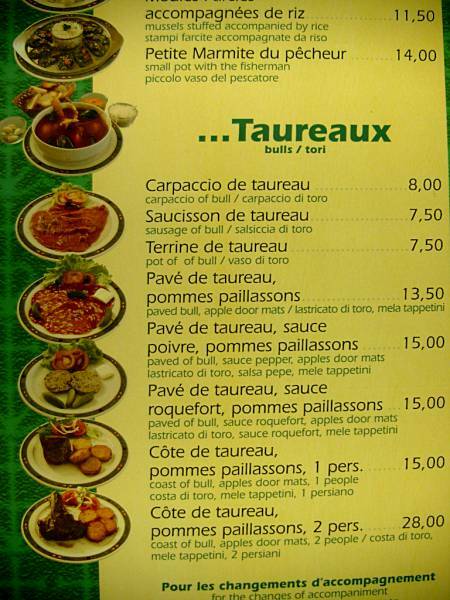 We were fascinated by the restaurant menus when we reached Saintes-Maries-de-la-Mer, not only for the variety of ways to prepare bull, but for the interesting translations into English! Paella and gypsy music were also offered at many places. 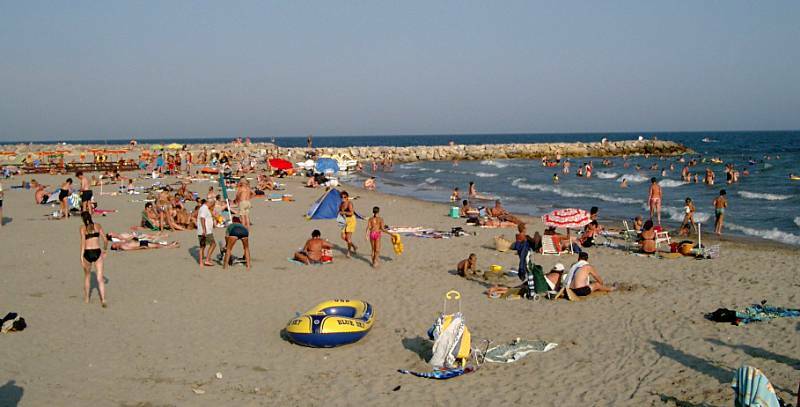 This city with its gypsy and Spanish-influenced demographic and holiday carnival atmosphere is the capital of the Camargue and boasts a wide clean beach favoured by holiday makers and retirees. The countryside on the way there was flat and featureless, but that’s because it is a preserved wetland area. Closer to the town we noticed many horse-riding establishments that looked like haciendas. The town was buzzing with people as it was market day and there were many people still at the beach, even at 6pm when we got there. 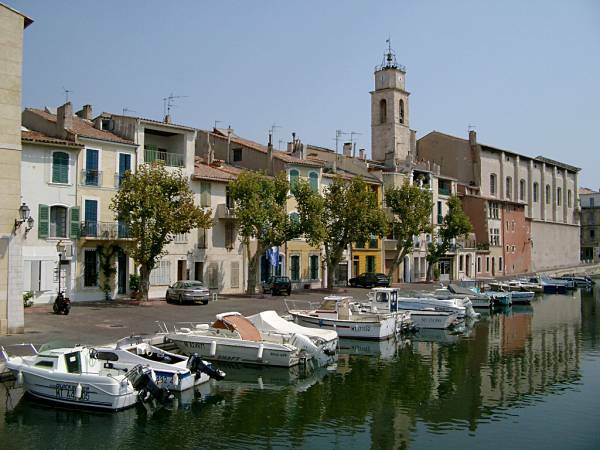 Further west along the coast, the pretty fishing port of Martigues is nicknamed the Venice of Provence due to the charm of its canals, docks and bridges. 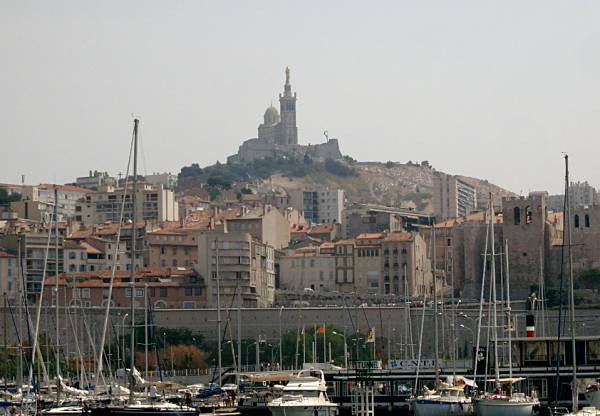 Approaching Marseille – the second largest city in France – we were somewhat overwhelmed and concerned that we would get lost and/or mugged, as at that time Marseilles had the reputation of being a rough city with a high crime rate blamed on its many immigrants and unemployed people. 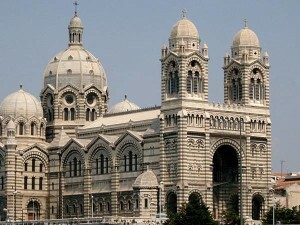 However we managed to see the Cathedral of Sainte-Marie-Majeure, find our way into the old port (Vieux-Port) area which is lined with cafes, and then wind our way across and up to the Basilica of Notre-Dame-de-la-Garde on the nearby hilltop, for spectacular views back to the heart of the city. 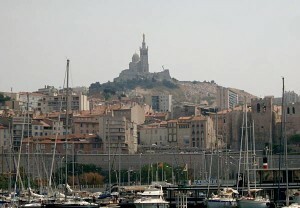 We continued on around the coast, admiring the Frioul archipelago with the prison of Chateau d’If on our way to Cassis. 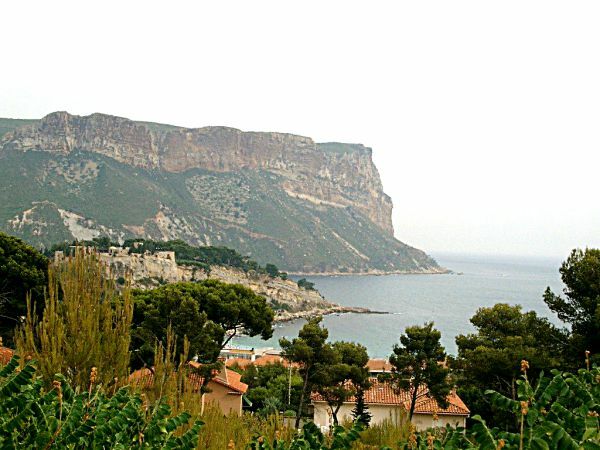 Famous for its cliffs (falaises) and the sheltered inlets called calanques, the town of Cassis is a popular tourist destination. The picturesque fishing port is lined with cafes and restaurants which we wandered beside trying to decide where we would sample our very first Bouillabaise. Several of the places claimed to be the sole authentic bouillabaise restaurant, which made it confusing. Eventually we settled on one and our fish soup/stew was presented – soup ladled into our plates at table and a large platter of mixed fish served at the side to share. I’m sure there is some sort of etiquette on how to handle this meal, but no-one offered to explain, so we did our best all the while expecting the waiters to be laughing at our expense. It was a memorable experience nevertheless. 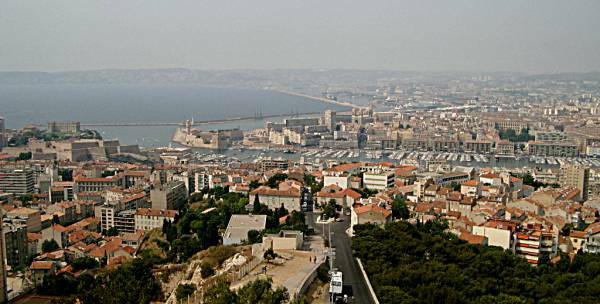 Provence Small-Group Sightseeing Tour: Marseille, Aix-en-Provence and Cassis – $144.92 Visit Aix-en-Provence, Cassis and Marseille on a full-day tour that combines Provence’s artistic heritage with stunning coastal scenery. 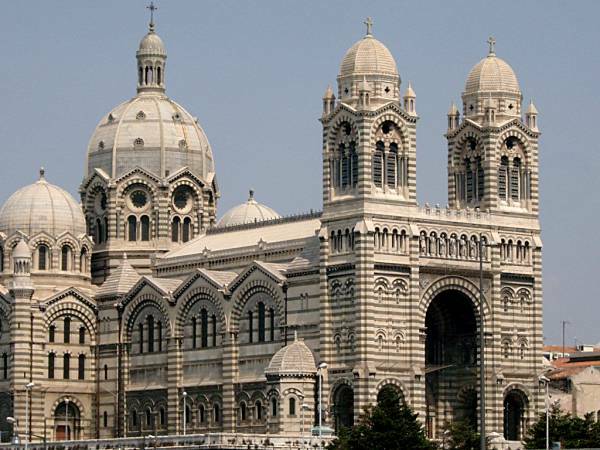 After setting off from Marseille, you’ll admire architecture on the famous Cours Mirabeau boulevard in Aix and then visit the Cezanne Studio (own expense) dedicated to the 19th-century French painter Paul Cezanne. Discover rock formations known as ‘calanques’ on a cruise from Cassis, and then finish your day with a sightseeing tour of Marseille. Numbers are limited to eight on this small-group tour, ensuring you’ll see the sights with personalized attention from your guide. 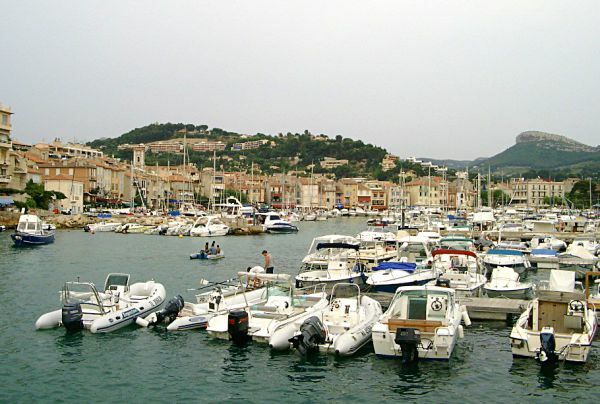 Private Provence Tour: Rhone River Cruise and La Camargue – $75.80 Start your day with a visit to Les Saintes Maries de la Mer, a famous site for gypsy pilgrimage. 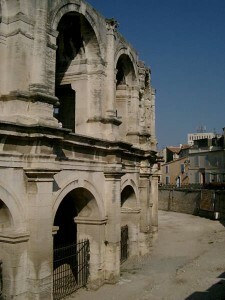 Its fortress church proudly holds the relics of Saint Sarah, saint of the Gypsies. Discover the wetlands surrounding this coastal town that is right on the edge of the Rhone river delta, along with the variety of flora and fauna that are at the heart of one of France’s most unique ecosystems. End your day with a trip to the small medieval town of Aigues-Mortes, Saint Louis’ gateway to the sea.